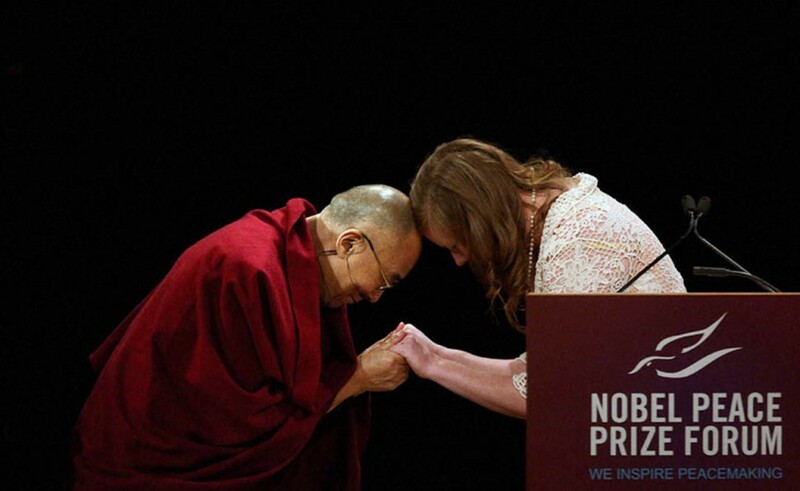 Anastasia Young and the Dalai Lama meet onstage at the Nobel Peace Prize Forum earlier this month. Photo courtesy of Nobel Peace Prize Forum. Moorhead, MN – Very few people can claim the Dalai Lama has snuck up on them. Concordia senior Anastasia Young recently returned from a trip to the Peace Prize Forum in Minneapolis, where she introduced the Dalai Lama before he spoke. Young received an unexpected experience with His Holiness. The Peace Prize Forum occurs annually at Augsburg College, designed to discuss the work of former Nobel Prize winners in an open forum. Concordia, along with five other Norwegian-American-based colleges, founded the program in 1989 and have sponsored the event ever since. “Everything I never thought would happen, happened,” Young said, recalling her time on stage. According to Young, she was to receive minimal attention from the Dalai Lama. Young said she felt relieved. She shares a joke between friends regarding the temperature of her hands. “My hands are always cold. They’re like icicles,” Young said. Despite those instructions, the Dalai Lama had a different agenda in mind. Later, Young was called on stage to introduce His Holiness with a two-minute speech. However, her attempt at a concise, straight-forward production was again thwarted. According to Young, the Peace Prize Forum’s audience began to “buzz” shortly after she reached the podium. Against the wishes of his security personnel, the Dalai Lama meandered onstage. She continued her speech – at the conclusion of her intro the Dalai Lama held out his hands. Young accepted them in her own and they bowed together, touching foreheads. Near the end of the forum, Young presented a scarf to His Holiness. After blessing the scarf, he gave it back, a typical Dalai Lama process. Young explained the journey leading to her time with His Holiness. After her freshman year, Young decided to pursue nursing and religion and studied abroad in India In the fall of her junior year. Upon her return, she applied to become an Interfaith Scholar. Concordia’s Interfaith Scholar program, founded in 2011 and headed by director of Forum on Faith and Life Dr. Jacqueline Bussie, accepted Young as one of the first Interfaith Scholars. According to Bussie, Interfaith Scholars work for the Forum on Faith and Life, researching and presenting religious studies to audiences across the nation. Scholars also host several on-campus religious events. Young’s experience through the Interfaith Program encouraged her to also become a Peace Scholar, a scholarship offered by Concordia each year. Students hailing from Concordia, Augsburg, St. Olaf, Augustana, Luther and Pacific Lutheran apply to become Peace Scholars, a status awarded with a seven-week academic trip to Lillehammer and Oslo, Norway. The Peace Scholar Program accepted Young as a 2013 Scholar. According to Bussie, The Nobel Prize Conference commissioned Young to introduce His Holiness based on her work as an Interfaith Scholar. Young returned to Concordia the final weekend of spring break.